Please check back for our next radio workshop date or click here to indicate your interest in a future workshop. We will contact you when we have a date for the next one. Pre-registration is required, to make sure we have enough materials for all kids attending. If you have a group that would like to attend their own workshop, we would be happy to work with you to schedule one. You’ll find more details about our radio workshops below. Please click here to indicate your interest in any of our upcoming Find Your Voice workshops, or scheduling one for your group. 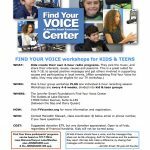 We hold radio workshops approximately every 4-6 weeks, alternating between kids and teens. We are available to create customized communications and media classes for youth groups – scout badges, home or charter school field trips, etc. We can do anything from one-day workshops to weekly/monthly classes. Let us know what you’re looking for, and we’ll work with you to put together an enriching program for your group. 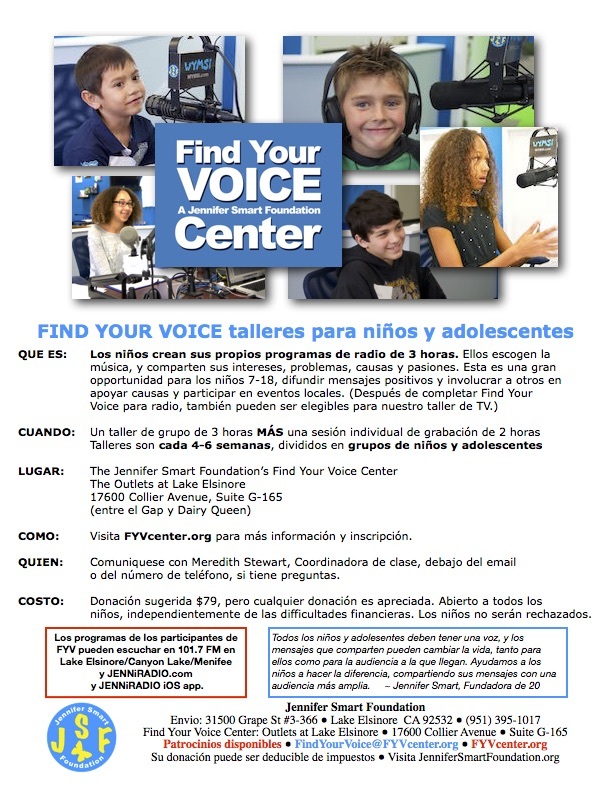 The Find Your Voice Center is located in the Outlets at Lake Elsinore, suite G-165. That’s closer to the north end of the Outlets, between the Gap and Dairy Queen. These workshops help sick, healthy & disadvantaged kids improve communication skills and increase self esteem. With our coaching, kids and teens create radio and TV programs, which we air on our media properties. This program is open to ALL kids and teens, regardless of their financial situation. We rely on our supporters to sponsor kids who participate in the Find Your Voice program. Click here to sponsor a child for this program, or visit our donate page to find out more ways to help. Here’s how it works… Kids come in to the Find Your Voice Center in the Outlets at Lake Elsinore for a 3-hour group workshop. We talk about radio and the importance of good communication skills. There’s a little history, a little social interaction, some breaks for water and snacks. We go over microphone technique, give them examples of the things we’ll be recording with them, and outline the “show prep” they need to do before their individual sessions. We block 3 hours for the individual session, on a day and time that works best for each kid (and parent) schedule. Most finish in closer to 2 hours, but some need the full 3. Some kids need to come back multiple times, in smaller doses. We do what works best for the individual needs of each kid. During their private session in our radio studio, we record them introducing the songs they selected, and talking about themselves and their passions, issues, etc. – whatever they want to share. The show prep has guided them through possible topics, and we coach them in-studio, helping them craft their messages. Through this process, kids are able to reach out to others who may have similar – or different – experiences. They get more comfortable sharing their thoughts and dreams, expressing themselves in new ways, opening up new lines of communication. Once we’ve finished the individual session, our team crafts a 3-hour show out of all the things we’ve recorded, plus the chosen songs. We weave together a tapestry of messages and music, that showcases the individuality of each kid or teen. At the Jennifer Smart Foundation, we believe kids have the power to make this world a better place. Given the chance to share their messages with a larger audience, they can truly make positive changes in themselves and all those they reach. 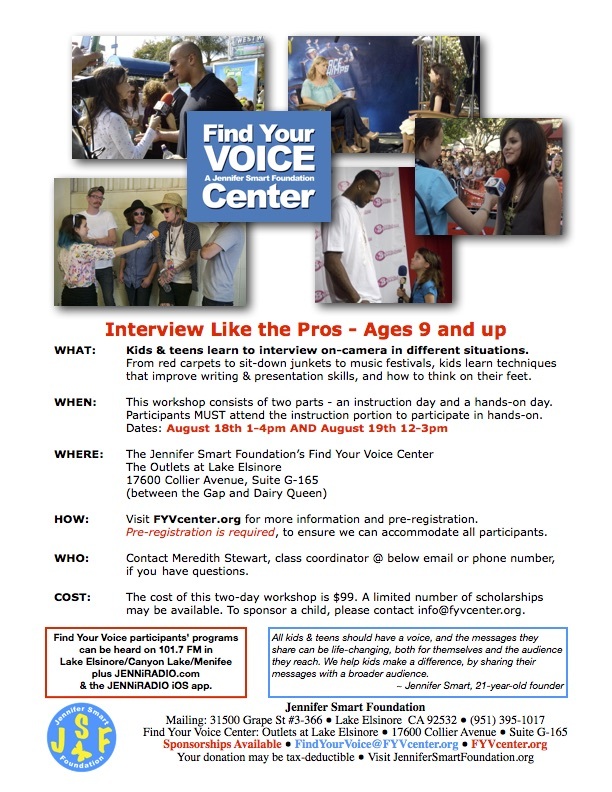 This program helps improve communication skills and self esteem, while giving kids a platform to change the world, one voice at a time. Click here to register your child, or here to sponsor a kid for this program. As a nonprofit, we suggest a one-time donation of $79 for participation in this program. We rely on our supporters to help us offer this program to ALL kids, regardless of their financial situation, so that we never have to turn away a child who could benefit from this program. Check out our local business sponsorship levels here. You can hear our Find Your Voice kids & teens Sundays 6-9pm and Wednesdays 4-7pm on 101.7 FM in the Lake Elsinore/Wildomar/Canyon Lake/Menifee area, at JENNiRADIO.com and through the free JENNiRADIO iOS app. Click here to indicate your interest in joining this one or a future Find Your Voice workshop. We hold group workshops approximately once every 4-6 weeks, alternating between kids and teens. Pre-registration is required, to make sure we have enough materials for all kids attending.